Mexico City, October 27, 2016 – Hurricane Matthew, considered the most damaging hurricane to hit the Caribbean since 2007, claimed numerous lives and devastated what it found in its path. The impact has been particularly significant in Haiti, a country where infrastructure was already limited. 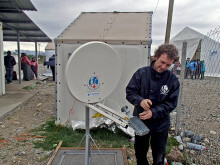 In crises and disasters like this one, connectivity is a critical element to enable humanitarian aid efforts, support the rebuilding of infrastructure and contribute to the speedy recovery of the affected territories. Télécoms Sans Frontières (TSF), the NGO specialising in emergency telecommunications, together with Eutelsat and Elara Comunicaciones, has arrived in southern Haiti to help begin restoring telecommunications on the island. The TSF team, with the help of volunteers trained by the organization, has mobilized through Haiti to support families that had no way to make calls after the natural disaster. Their efforts, along with those of Haitian civil protection authorities, have allowed communities affected by Hurricane Matthew to remain connected. 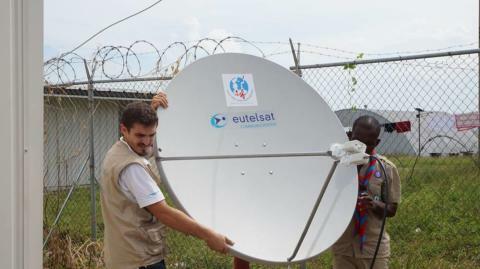 Eutelsat’s experience in satellite communications and its 10-year relationship with Télécoms Sans Frontières have enabled services to be routed through the EUTELSAT 117 West A satellite and an IP cloud configured by Elara Comunicaciones, which consolidates and increases communications efforts in Haiti. In leveraging the combined expertise of the three organizations communications can be established within hours, enabling vital relief work to get underway.